It takes courage to "get to the Lord" and courage to "challenge the Lord" like the leper who said to Jesus: "If you want you can heal me". "The Lord has told us: 'Ask and it will be given to you’. We also take this Word and we trust, but always with faith and putting ourselves at stake. This is the courage that Christian prayer has. If a prayer is not courageous it is not Christian". 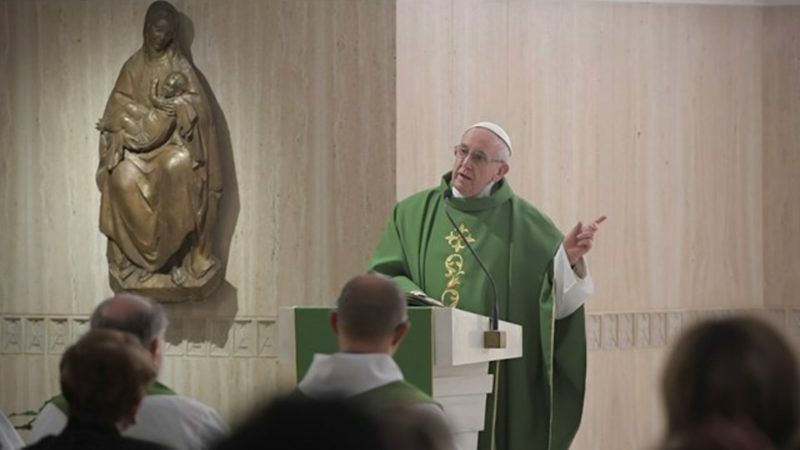 Vatican City (AsiaNews) - Christian prayer is "courage": it is born of faith and wants courage to "reach the Lord" and courage to "challenge the Lord" said Pope Francis in his homily at Mass this morning at Casa Santa Marta. The Pope recalled that the Gospel readings from Mark tell of two healings, that of the leper and the paralytic. Both pray to receive, both do it with faith: the leper, underlined the Holy Father, also challenged Jesus with courage, saying: "If you want you can purify me!". And the Lord's answer is immediate: "I want to". Thus everything is, as the Gospel teaches, "possible for those who believe": Always, when we approach the Lord to ask for something, we must start from faith and do it in faith: "I have faith that you can heal me, I believe you can do this" and have the courage to challenge you, like this leper, this paralytic. Pray in faith. Pope Francis went on to say that, the Gospel therefore leads us to question ourselves on our way of praying. We do not do this as "parrots" and without "interest" in what we ask for, if anything, suggests the Pope, we beg the Lord to "help our little faith" even in the face of difficulties. In fact, there are many episodes in the Gospel in which to approach the Lord is difficult for those in need and this serves as an example to each of us. The Holy Father continued, the paralytic, in today's Gospel of Mark, for example, is even lowered from the roof because his stretcher reaches the Lord who is preaching among the immense crowd. "One’s will finds a solution", underlined the Pope, and "goes beyond the difficulties": Courage to fight to get to the Lord. Courage to have faith, at the beginning: "If you want you can heal me If you want, I believe '" And courage to get closer to the Lord, when there are difficulties. That courage ... Many times, it takes patience and knowing how to wait for the moment, but do not give up, always go forward. But if I go with faith to the Lord and say: "But if you want, you can give me this grace", and then but ... as the grace after three days has not arrived, another thing ... and I forget. Saint Monica, the mother of Augustine, said Pope Francis, prayed and "cried a lot" for the conversion of her son, and managed obtain it. The Pope quoted her among the many saints who have had great courage in their faith. Courage "to challenge the Lord", courage to "get involved", even if you do not immediately get what you ask, because in "prayer you play hard" and "if prayer is not courageous is not Christian": Christian prayer is born of faith in Jesus and always goes with faith beyond difficulties. A phrase to carry in our hearts today will help us, from our father Abraham, to whom the inheritance was promised, that is, to have a child at the age of 100. The apostle Paul says: "Believe" and with this he was justified. Faith and to "set out" in faith and do everything to get to that grace that I am asking for. The Lord told us: "Ask and it will be given to you". We also take this Word and we trust, but always with faith and putting ourselves at stake. This is the courage that Christian prayer has. If a prayer is not courageous it is not Christian. 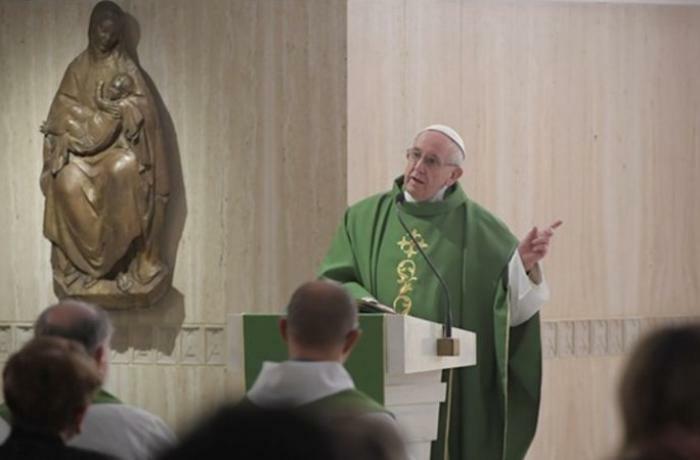 Pope: Praying "face to face" with God, not "parroting prayers"
Pope: we must pray with courage, persistence, become "tiring": praying is also "negotiating with the Lord"